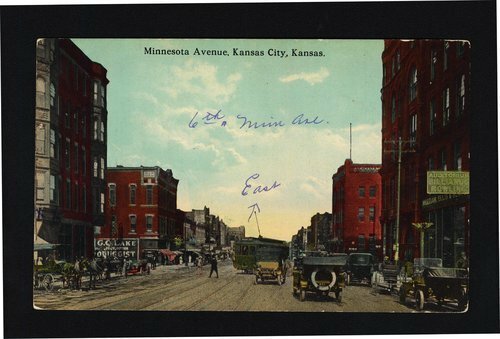 This colored postcard shows a view of Minnesota Avenue looking east from 6th Street in Kansas City, Kansas. A business building with a large sign reading, "G. Q. Lake, Prescription Druggist," is visible on the left side of the street. Several other business buildings are visible along the street including one the says "Auditorium, Billiards Bowling". A horse-drawn carriage is visible on the left side of the picture, while several automobiles and a street railway car are visible. Holding Institution: Lois A. Hodge, 1973.